Can’t seem to finish a project before the deadline? Having a long, hard time trying to fix a complex and tedious line of projects (which you think shouldn’t be so)? If you are a project leader and experience all of this or maybe worse, then you might want to change things up a bit and look for another angle. No, you don’t have to find a new team. They are not the problem. What you need is a set of tools that can help you and your team to manage your project faster, easier, and without exerting too much effort. You’re in luck because in this post, we have listed 12 tools to get you started right. All these can be found online, and are sure to make project management less of a pain in the head. Trello is no ordinary project management tool. It is known for its visual way of viewing the entire project at a glance on a bulletin-board-like dashboard. It is a great tool for managing short, quick, but complicated projects. With a Pinterest-like interface, Trello allows you to create cards that you can use to write your ideas, thoughts, conversations, and to-do lists. You can also organize and arrange these cards depending on chronology and their level of priority. It also enables you to create unlimited tasks, allows you to share files and images, and lets you comment or give feedback to your team member’s tasks and assigned projects. It is also a great visual collaboration tool, where the team members working on the same project can access and modify or make some changes to the projects remotely. Trello is free for personal use, but they also offer a good package. Their paid plan starts at $9.99 per user per month, which includes additional features and awesome extensions. Freedcamp is project management software designed for businesses of any size that wants to scale up their projects. This tool offers unlimited users, projects, and storage. It also offers time management tracking features and project templates, and allows you to send invoices fast and easy. You can also create sticky notes using Freedcamp’s “kanban” board, where you can manage and organize these notes. It also has an intuitive interface, making it very easy to use. Freedcamp has an organized dashboard to view the entire project. Administrators can create different levels of permission and access, right down to the client level. This ensures that the project team members, as well as the clients, know their assigned roles. A great touch of this tool is its collaboration features. Project team members and clients will never be left out as this feature allows you give regular updates of any changes made to the project, sending team members and clients a Facebook-like notification. While this tool lacks important features such as Gantt charts, task dependencies, and recurring tasks, it is still an effective project management software. They have a free plan and paid add-ons. Zoho Project is known for its simple approach to project management. It helps the team streamline the process of managing projects and task lists. It is an effective project management software with its time-tracking and time-sheet features. Plus, it comes with a Waterfall method and Gantt chart feature to forecast progress on the project. Zoho Project also offers bug tracking, advanced integration with Google Apps and Dropbox, as well as Wiki pages for the repository of information, and an extensive forum section. This tool also provides detailed reporting that enables you to create reports. They have 50 pre-made report templates that you can choose from if you don’t want to create your own report. But, what’s great about Zoho Project is that it can be integrated with Zoho CRM and other tools, so you can manage every aspect of your project within a single platform. Their free plan only offers 10 MB of storage, but you can upgrade to their paid plan, starting at $20 a month, and enjoy an additional 5–30 GB of storage. Wrike is one of the best project management tools for smaller teams. It has all the project management features your business will need, plus it packs great security features. Users of this tool can set a privacy setting on their projects and interact with its real-time activity stream. Wrike allows you to have a quick overview of the entire project plan, your team’s progress and performance, and their workloads and deadlines. You can track their everyday tasks and performance and create a report based on their achievements, which can help you and your team to improve the overall performance. Other top features of Wrike includes task management functionality, project planning and dashboard, storage expansion through integrations, project and file attachment, and a lot more. Integrations with other business tools—such as Google Apps, Microsoft Excel, and Dropbox—is also easily managed with Wrike’s third-party app integration feature. Wrike is free for up to five users and offers 2 GB of storage. However, the free version of this tool won’t do much of project management as it does not have paid features such as Gantt chart, time tracking, and the real-time activity stream. You have to purchase their paid plan, starting at $9.80 per user per month, to have all the project management features. JIRA Software, a product from Atlassian, is a cross-platform issue- and bug-tracking software. But it is also packed with advanced project management capabilities and features, making it one effective tool for managing and organizing projects and tasks. It is specifically made for software development teams to manage their software and IT projects. Now, many businesses big and small use JIRA Software to manage their IT-related projects. This tool makes it easy to find and track issues, which is critical for any project to run smoothly and error-free. It also allows you to oversee project progress. What’s great about JIRA Software is that it allows you to create user stories and issues, plan sprints for projects, distribute tasks across your team members, prioritize and discuss team’s projects, centralize your team’s conversation, and allows you to see real-time reporting of your team members’ performance and tasks. JIRA Sofware can also be integrated seamlessly with other products of Atlassian, such as Confluence (a document collaboration tool), and HipChat (a team chat, and video- and file-sharing platform). JIRA Software’s pricing starts from $10 per month for up to 10 users, $75 per month for 15 users, and $300 per month for 50 users. Teamwork is a 3-in-one management platform that includes a project management software, chat management software, a help desk, and support ticket software put together in one place to help you streamline your business and projects. Teamwork’s feature in the spotlight is Teamwork Projects, which focuses on project management and enhancing team collaboration. It keeps all projects, tasks, files in one place, making it very accessible to anyone on the team who has access permission. Teamwork Projects helps you and your team see the entire project through a marked calendar; an extensive, fully detailed Gantt chart; and setup reporting. It also enables you to customize each feature on each project to meet the requirements of the project. Teamwork allows you to conduct milestone management, create a list of tasks with sub-tasks, and set comprehensive user permission. In addition, it supports file management with Google Drive, Box, and Dropbox. Teamwork Projects can be integrated seamlessly with Teamwork’s other two collaboration products, Teamwork Chat and Teamwork Desk, so you and your team can manage the project effectively and make the process faster and much easier. Their pricing starts $12 a month with unlimited users. Basecamp is considered to be the father of all project management software and one of the leading project management software out there. It is also the preferred tool for thousands of project management teams. It has a modern social media-like interface and very intuitive team collaboration feature. 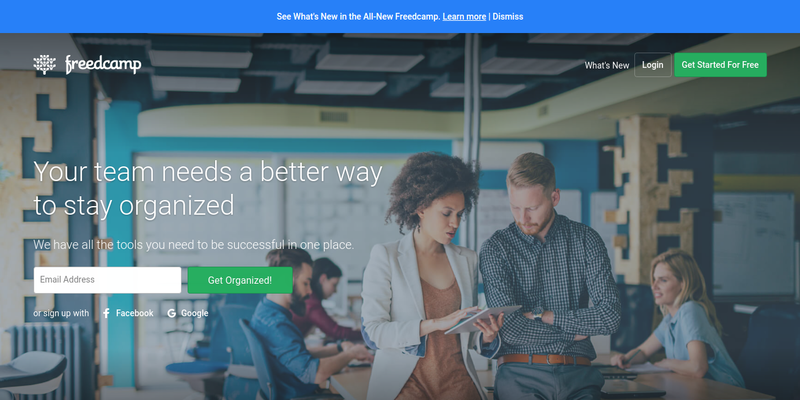 Basecamp enables you to create and manage multiple projects, set up a discussion for the team’s project, create, manage, and share files or documents, and organize dates for project scheduling. It even lets you write (and share) a to-do list. For effective project management, it integrates message boards, in-app collaborations with the team, a separate dashboard for clients, reporting features for team performances, and email and desktop notifications. All of this fully responsive and supported on mobile devices, so you can manage all your projects on the go and check the status and project progress anytime, anywhere. On top of that, Basecamp is free to use for teachers and students. All you have to do is present credentials to confirm your identity as a student or a teachers. For businesses and other professional project management teams, their paid plan starts at $99 per month with unlimited users. Podio as a project management tool is a flexible and highly customizable online hub for project and team communication. It is very user-friendly, can adapt easily for growing businesses, and allows you to personalize its features to fit your business. With Podio, you can assign tasks to each project team member, attach files and documents, and discuss details and a proposed solution with the team. You can also share encrypted files and large files. It even allows you to automate the sales pipeline and forecast budget tracking, among other impressive features. Podio enables you to get an overview of your business, project, and team member on a single visual dashboard. The best part? Podio’s workflow feature allows you to add the “if this…then that” logic to any of the Podio apps. For example, you can create a logic or a task instructing your app to perform a particular task or bring up a comment every time an item is created, changed, or updated. On top of these, Podio can also be an intranet for all your colleagues, departments, and team members to interact with. And, this tool can also be turned into a full CRM platform, allowing effective customer relationships while managing your projects. Podio can be purchased for $24 per month per user for a full suite of features. Asana is one of the most popular projects management software with over 140,000 customers and 1.4 million users. Apart from that, Asana is also the most reviewed project management software, maintaining a 4.5/5 overall score with 2000+ reviews on leading review sites. Not only does this tool focus on project management, it also one of the best tools for file storage, collaboration, and managing projects for your team without the need for email or other third-party apps. Asana also offers tracking and reporting, allowing you to track your team’s performance as well as the progress and the status of the project. And then, you can create a detailed, understandable, and comprehensive report. One of Asana’s most impressive features includes the breaking down work into individual tasks and assigning them to team members, allowing for a faster finish. It also organizes your tasks into projects and creates timelines and an extensive road map. You can review the milestones of the project and check your team’s progress. You will also be given updates every time there is an update on the project. Although Asana does not allow offline use, its online features are very easy to use and do not have a steep learning curve, making it ideal for a first-time project management team. Plus, it is free for up to 15 members, and you can upgrade to premium starting from $8.33 user per month. Active Collab is a project management tool that is both simple and powerful. It allows you to maintain a single dashboard where all of your work is put together. You can track your projects, get real-time updates, and see what you have to do next. Active Collab features task filtering, where all of your tasks are organized based on your needs. You can filter your task by label, due dates, and when it was last viewed and modified. Task filtering also allows you to immediately find a specific task, and runs a report to list everything on one page. It also integrates seamless workflow, allowing you to quickly and easily create a new task, attach files, set deadlines, leave comments on your team members’ finished or unfinished task, and set up notifications for important updates. Other features of Active Collab include time tracking and invoicing, a Gantt-like timeline for planning, Kanban cards across columns, and a shared team calendar for collaboration. The collaboration features of this tool is also very helpful, with functions like collaborative text editing and Twitter-like mentions for communication. It also supports other third-party business tools for effective and streamlined project management. The Active Collab cloud plan start at $25 per month. And, they offer a self-hosted version if you want to run this tool on your Web browser. The self-hosted version can be purchased for $499 per month. Bitrix24 is a project management software that offers a complete suite comprised of team collaboration, communication, and extensive project management tools. You will also have the option of running Bitrix24 in the cloud or on a self-hosted server. Bitrix24 offers some impressive features including a detailed Gantt chart, layered task options, time tracking and management, and complete planning for an employee or team member’s workload. This tool also has social intranet for internal communication. This tool integrates a full CRM (customer relationship management) feature and can be integrated seamlessly with a telephone. Real-time communication is also made a lot easier using group chat, video conferencing, and an instant messenger. From the traditional project management to integrated telephone and HR system or internal email, all of it is incorporated by Bitrix24. However, many users become overwhelmed between its project management functionality and CRM tools. Most user complaints are due to the CRM. They have a free plan with unlimited users but limited to 5 GB of storage. Their paid plans with more storage go for $39/month. 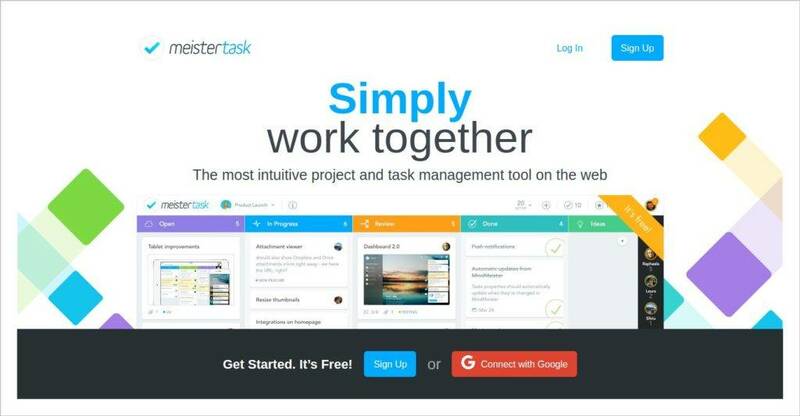 MeisterTask is an intuitive project and task management app that services unlimited users and projects. It also offers a smart, visual, and agile way of creating and managing projects. You can add as many members as you want, assign them tasks, and follow each other’s progress. This tool comes with a time-tracking and issue-tracking features, as well as collaboration tools for both internal and external users. MeisterTask’s board is perfect for various agile methods and can be customized so that the board works well given the project. Using the same board, the team can add notes, comments, feedback, in Kanban to Scrum and various mixed forms. The only drawback is that this tool is still quite new at the time of writing, so its development team is still working on some project management tools such as Gantt charts and CCPM. But, it’s free to use.